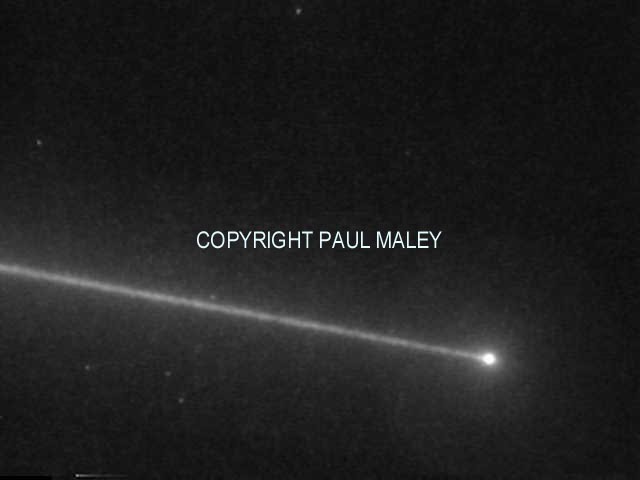 Paul Maley recovered USA 186 (05042A / 28888) last night. I reduced the following three points from video frames, using ObsReduce. Paul’s site co-ordinates are 33.8117 N, 111.9524 W, 659 m. Site ID number 9802 is provisional. confirm the new orbit and to refine the elements. Beginning at the age of 13 I started to observe interesting artificial satellites; today I provide these web pages as an educational and informative tool for future observers. There are other supporting web pages here where I have documented observations and photos. 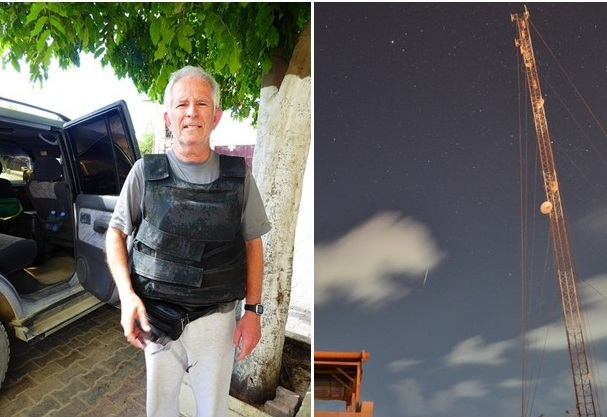 The author (left) and a flare from Iridium 76 (below the cloud) photographed from Mogadishu, Somalia, April 2017. P. Maley photo. In particular, I have been observing, photographing and videorecording artificial earth satellites around the world since 1972, sometimes from dangerous places. 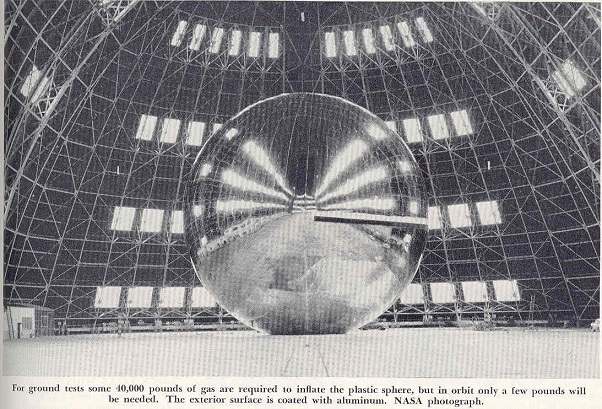 The space age technically began with Sputnik I in 1957. Yet the satellite that first caught my eye and got me into the discipline was the 100 foot (30m) diameter NASA balloon called Echo I. This zero magnitude communications satellite was launched in 1960. Shortly thereafter I read a prediction of its naked eye visibility in the local newspaper over San Antonio, Texas where I lived. I went outside and saw it and then watched as it disappeared into the shadow of the Earth. That sight was puzzling, yet amazing. My goal then was to eventually work at the NASA Johnson Space Center. This happened in May 1969. Part of my job was to generate viewing predictions for spacecraft that could be tracked by the 16-inch telescope located there that was being used to test star trackers for the Apollo missions. One ephemeris showed a favorable viewing opportunity during the Apollo 13 flight. On April 13 four of us gathered in Bldg 16 and watched the monitor as the spacecraft was slowly moving through a starry background. All of a sudden a quarter-sized image appeared on the screen that turned out to be the cloud generated by the infamous oxygen tank explosion. Apollo 13 was 205,000 miles from Earth and yet myself, Andy Saulietis, Pete Peterson and Wycke Hoffler saw this incredible event as it unfolded. 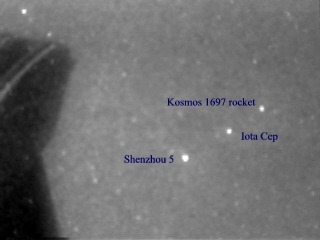 Amateur and professional astronomers often encounter satellites by accident (or on purpose) in their nightly activities. Since these objects are visible mainly by reflected sunlight nearly all such objects are visible only in the period between sunset and sunrise. 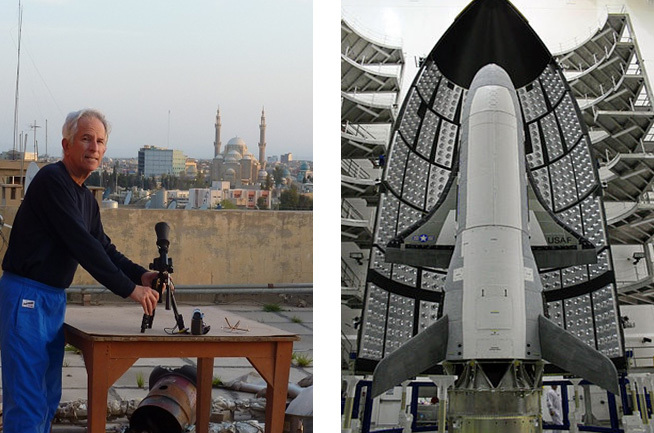 My setup for video observation of a military shuttle spacecraft X-37B OTV-2 (pictured on the right) from the roof of a hotel in Erbil, Iraq April 2, 2011. Photo by L. Palmer during my 51st year of satellite observing. Satellite observing is a passion of mine. I have travelled to many places to observe unusual encounters with these flying spacecraft. 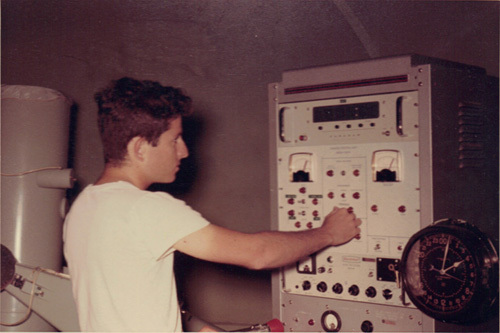 In my undergraduate days (April 1969) I worked at a GEOS tracking station at Moore Field, Mission Texas. Here is what a reentering Space Shuttle looks like! 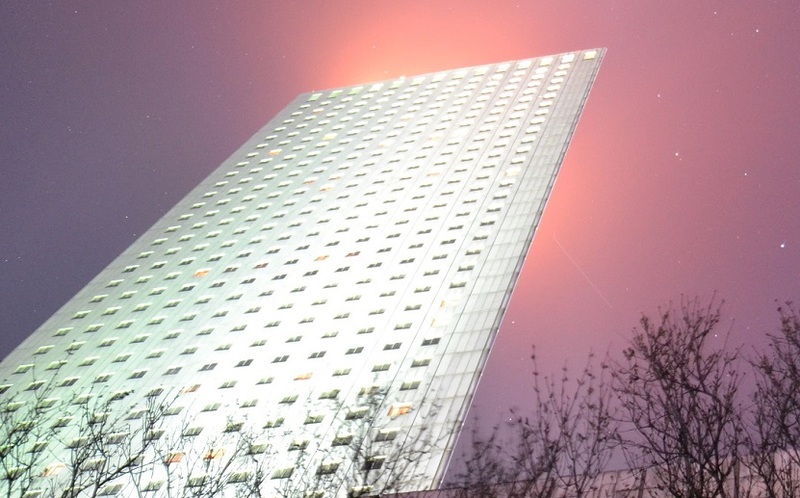 Two Iridium satellites fly over a Moscow apartment building! 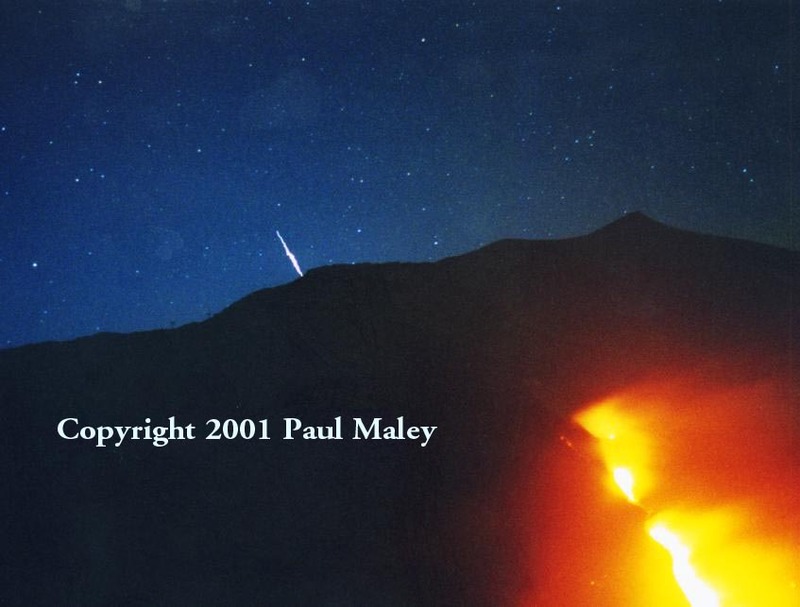 An Iridium satellite flares over Mt.Etna during a volcanic eruption! 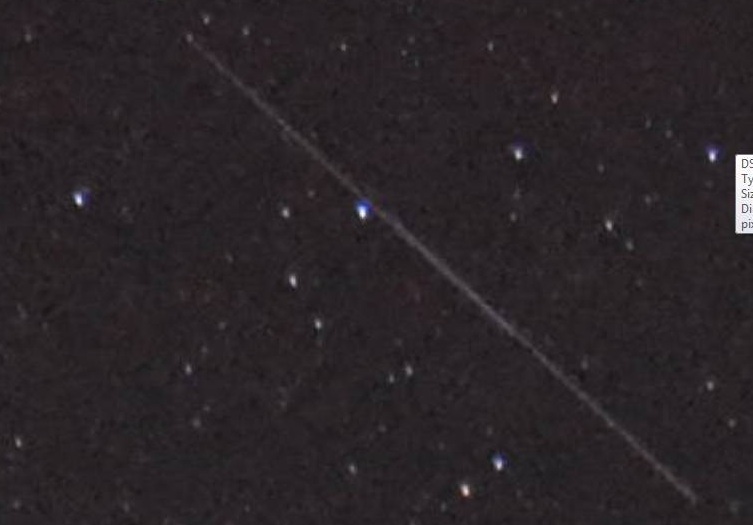 While on my 13th aurora viewing expedition there was a favorable flyover of the Iridium 6 satellite. Normally when an Iridium satellite flares, there is just one flareup. In this case there was a second flare occurring a few seconds after the first. Brightness of the first flare was -3 as seen from east of Fairbanks, Alaska. The linear track shows the path of Iridium 6 in this 25 second exposure. Paul D. Maley photo. A $270 million X-ray telescope called ASTRO-H and later, Hitomi, launched by the Japanese Space Agency experienced an anomalous event on orbit and began to spin. Contact with the satellite was lost by JAXA on March 26. Five pieces of debris were linked to this event. I was able to capture it on March 28 as it flew south of my position in Carefree, Arizona at 0319UT. The video showed an approximate rotation period (that is, a 360 degree spin period) of 23.5 seconds. Its orbital inclination was 31 degrees making may 34 degree N latitude location perfect for early observation. 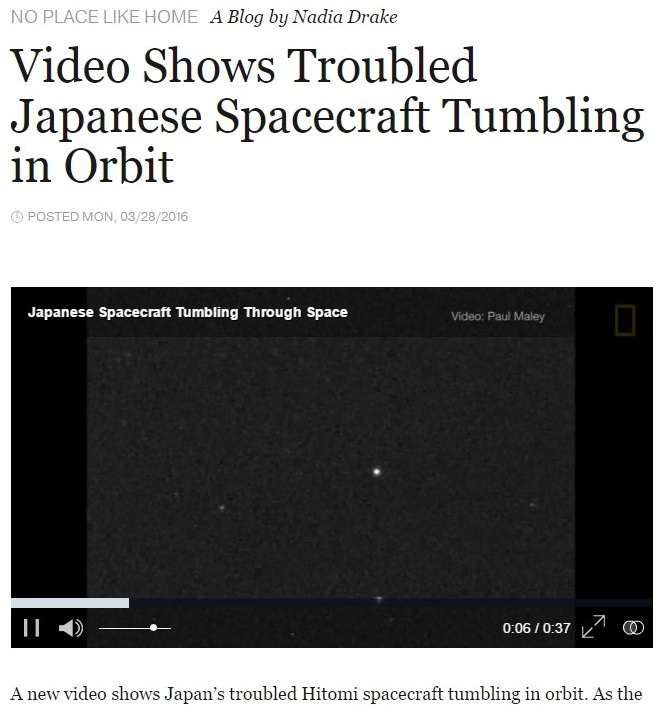 The story was picked up by a number of media sources including National Geographic, Space.com, BBC, NHK and Asahi TV News. The image above is a frame grab from the National Geographic blog page. 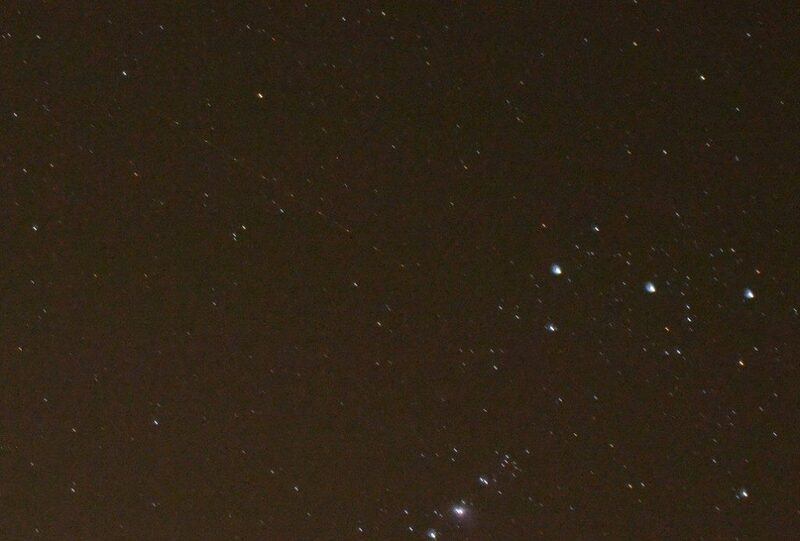 One of the Hitomi satellite pieces that I photographed at 0330UT on April 4, 2016. Nine flashes appear 0.77 seconds apart. A 12 second exposure, ISO3200, Nikon D3100 and 50mm lens. The Iridium 10 spacecraft appears as a faint streak in the eastern sky behind the Yanggakdo International Hotel in Pyongyang, North Korea. I photographed this predicted -8.4 magnitude flare event but it turned out not to be nearly as bright as predicted. The background satellite magnitude was only about +3. 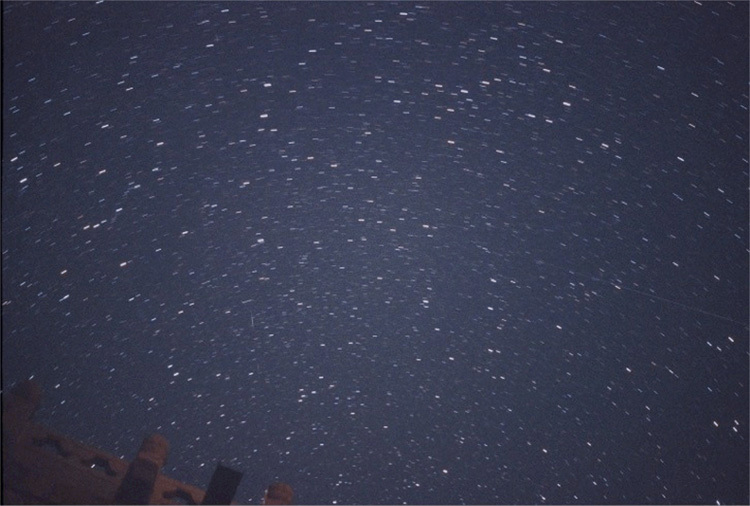 A 15 second exposure with the satellite passing through elevation 60, azimuth 114. A Minotaur I launch vehicle blasted off from Pad 0B at Wallops Flight Facility at 1:15 UTC on November 20, embarking on a 30-minute flight to deliver a total of 29 satellites to orbit. Highlighted by the primary spacecraft, STPSat-3, the Minotaur also carried 28 CubeSats to orbit for NASA and other US government agencies. I watched the ascent from Alexandria VA initially through cirrus as the rocket ascended to about 300,000 ft in altitude before I lost it. Max elevation reached was about 20 degrees above the east southeast horizon. About 1m 16s into my video as small pieces seemed to be shed. Video was shot with a PC164EX2 camera and Celestron 70mm refractor manually tracked under windy conditions. Peak of trajectory as the rocket moved away from me. 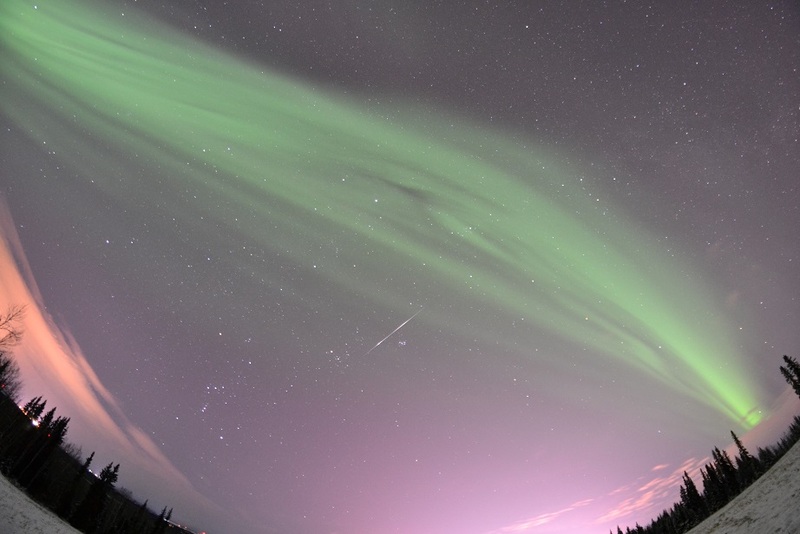 Observations of auroral activity were conducted north of Fairbanks, Alaska. 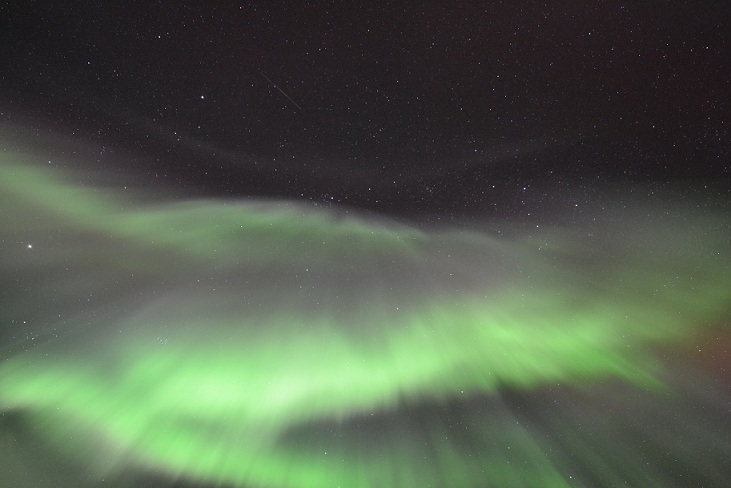 Spectacular overhead auroras were seen. At around 2.06am local time two satellites very close together, one following the other were captured in the above exposure just above the auroral band. A closeup is shown below. The UARS satellite made its last visible pass over the US at 01h18m UT on Sept 24, 2011 streaking over Piersall and San Antonio, Texas northbound at an altitude of 145 kilometers. I was able to video tape the event from Houston, Texas some 300km east. Rising in the sky at an elevation of only 9 degrees to my southwest shortly after sunset the tumbling spacecrafat was still intact as I tracked it in a 50mm video system until it hit the Earth’s shadow just 59 seconds later. This video can be found at http://www.poyntsource.com/tmp/maley_UARS92411.avi It is 170MB and takes a while to download. 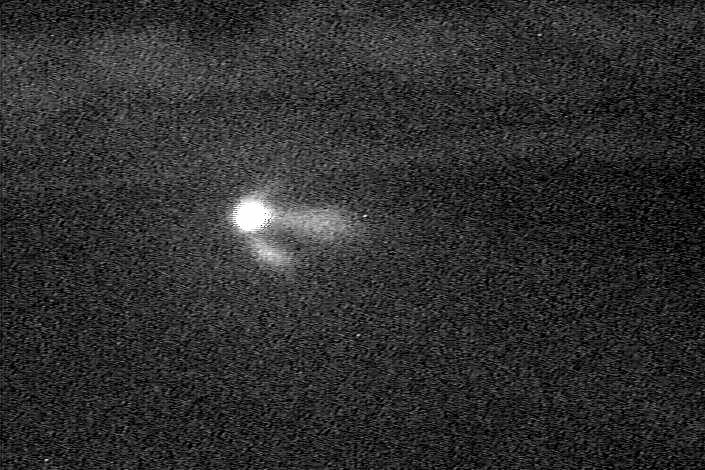 This is the last actual video of the intact spacecraft prior to its reentry about 2.6 hours later over the Indian Ocean. 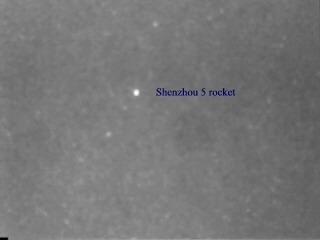 Shenzhou 6 spacecraft passed over the Beijing, China area 3 days after launch. 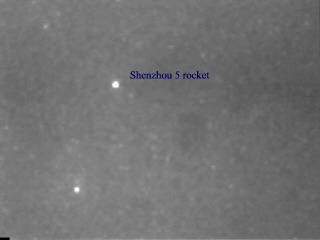 This image below shows the track of Shenzhou 6 appearing out of the earth’s shadow on the meridian and moving to the east. It is the streak on the right side of the frame. 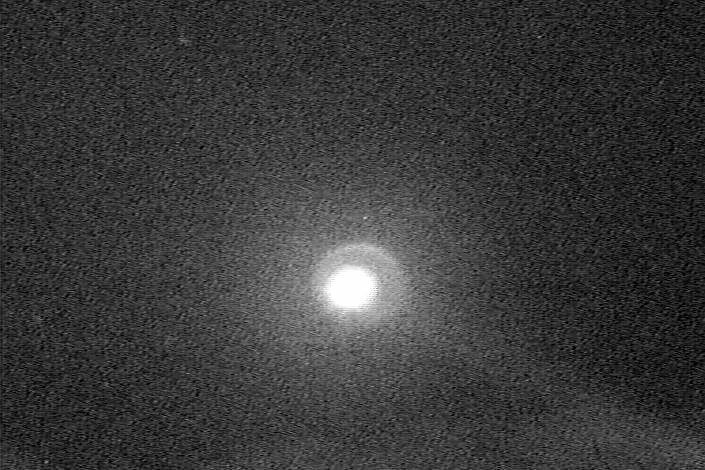 Also recorded were two faint maxima of an old Russian rocket (1974-24J) in the same frame (located just below left center moving downward). Time was 5:45am Beijing Time October 14; view is toward the north with the point of appearance of Shenzhou 6 at elevation 60, azimuth 358. The next morning I also observed both from the roof of the Holiday Inn Downtown Beijing with just the unaided eye before sunrise (no photos shown). I took video of the Shenzhou 6 rocket body (CZ-2F) as it rises in the west above a section of the Great Wall of China located at Badaling. Note the watch tower on the wall in the left portion of each of the following images. 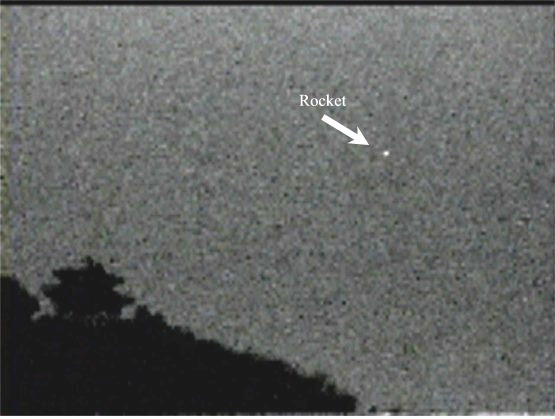 The rocket is shown in the next two frames as the single bright dot to right of center; it traveled from west to east and varied from peak to peak maximum brightness in 18 seconds. The frame below shows the rocket rising up from a hill with a watchtower that is part of the Great Wall of China. The pass occurred in very strong twilight with just a few bright stars visible to the eye. 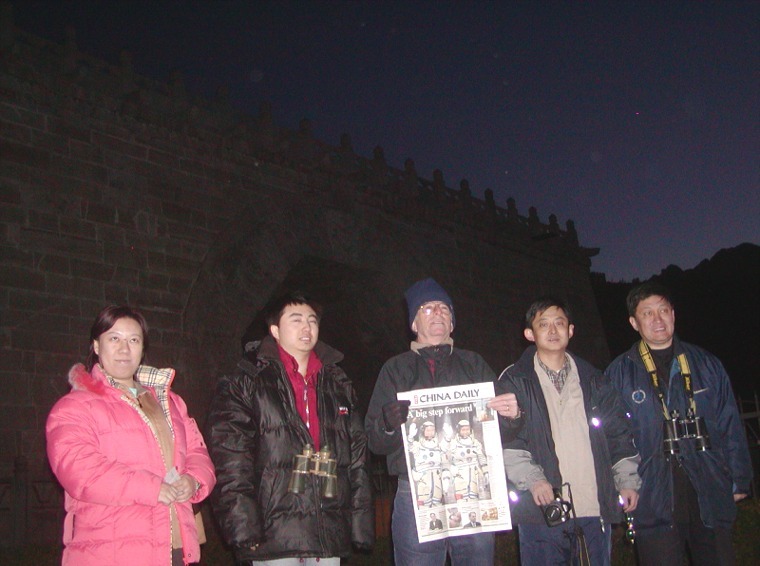 The Shenzhou amateur team after the flyover. 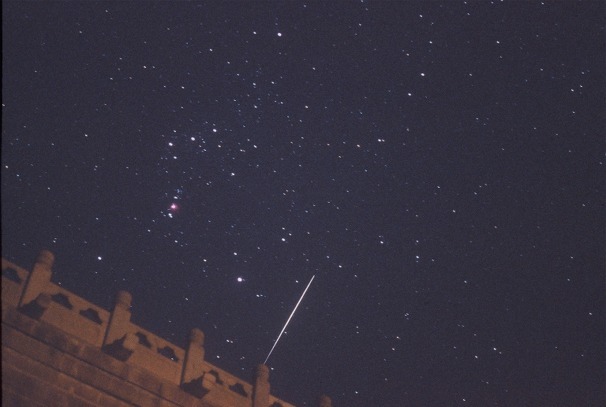 An Iridium flare occurred shortly before the Shenzhou 6 flyover and it passed through the constellation of Orion. 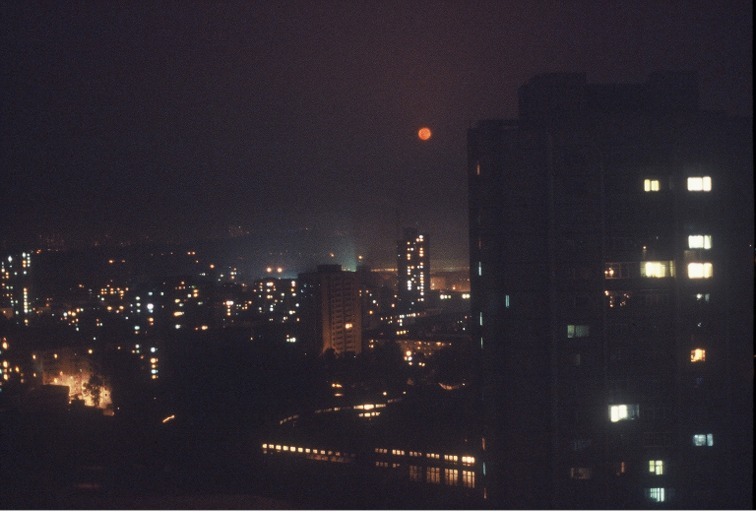 The next day I flew to Pyongyang, North Korea and took this photo of moonset against the skyline. The moon is in the west and descending into a pall of air pollution coming from a factory along the horizon. This was just two days before the partial eclipse of the moon on October 17, 2005 which I was able to video tape there. 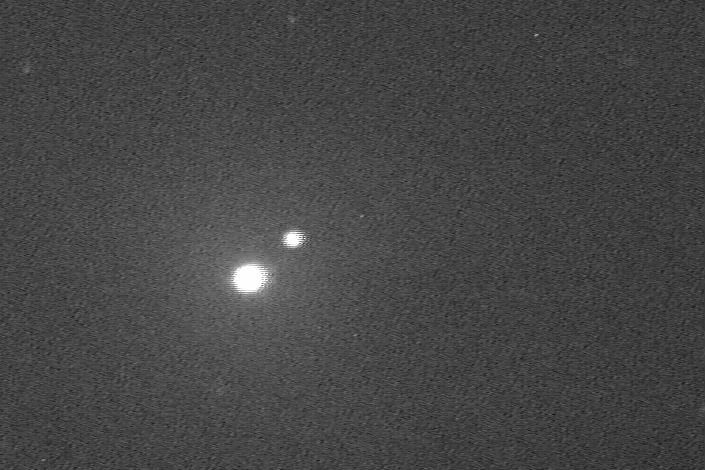 Both the DART spacecraft and MUBLCOM are visible to the left of center in the above image. Videotaped from Brenham, Texas at 0237UT, elevation 40, azimuth 40 range 680 st. mi. Video shot with 150mm Nikon lens, and Watec 903 video camera. An image intensifier was not used or the image of MUBLCOM would be more distinct. 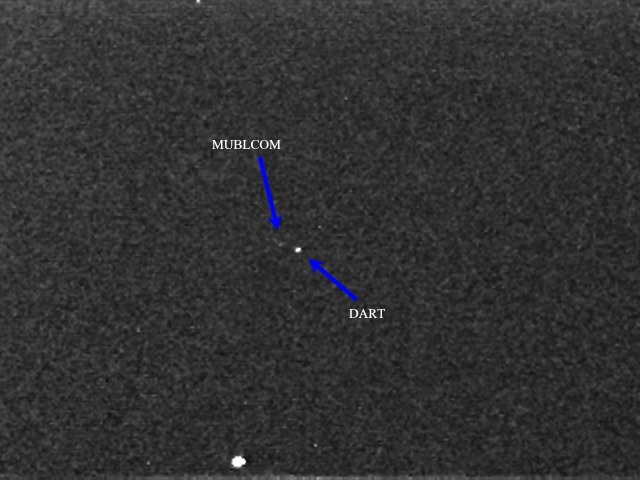 DART is estimated to be about 1 mile away from MUBLCOM. The image was taken 9 hours 10 minutes after launch of DART. A pictorial is shown above of what the two spacecraft should have looked like. MUBLCOM is the Multiple Beam Beyond Line-of-sight Communications satellite launched in 1999. 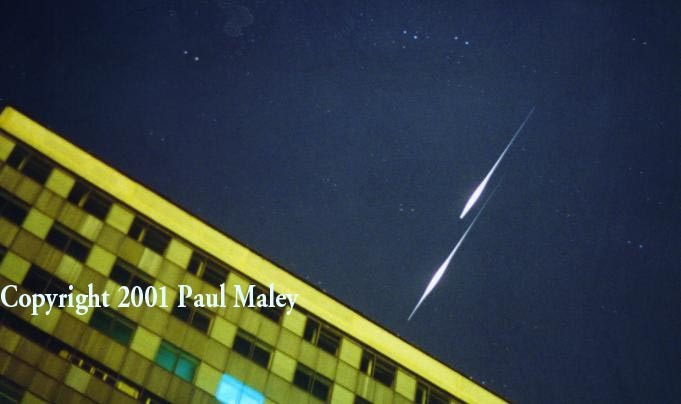 Shenzhou rocket body (at minimum brightness) precedes the Shenzhou 5 at 1125UT from Gene Autrey, Oklahoma. Video shot with 50mm Nikkormat lens, image intensifier, Watec 903 video camera. 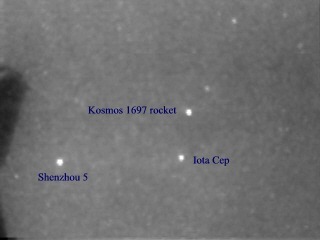 The Shenzhou 5 appears during its 7th orbit in the same part of the sky with Kosmos 1697 rocket at 11:28:07UT passing near the star Iota Cepheus. Dark silhouette in foreground is an oil pump. 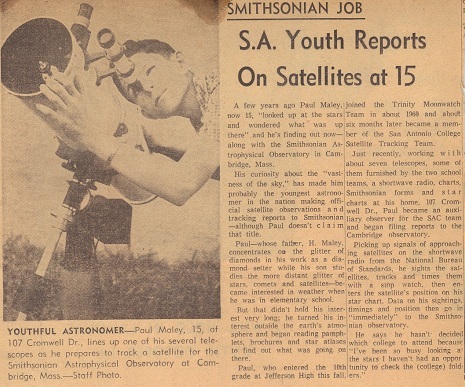 Satellite observing has long been an important avocation for me since my first earth satellite observation in 1960 from San Antonio, Texas. My mentor during that time was Fred Ball, Jr. a professor of mathematics and San Antonio College. Since that time I also maintain many other astronomical pursuits that include occultations, eclipses, comets, and meteor showers. However, my interests in satellite observation have varied from tracking specific objects for fun, to tracking for research purposes. I was the official photographer for Space Services launch of the Conestoga I rocket from the coast of Texas. The photo below made it on the cover of AVIATION WEEK & SPACE TECHNOLOGY. Not only do I follow them from home, but also when I am traveling on business and during vacation. I compile magnitude records on some satellites in an effort to keep ‘an eye’ on selected targets in space to see what they are doing now and how they have been behaving in the past. Perhaps one reason why I enjoy it is that so few others seem to focus on this field of observation. It is quite a challenge to track small man-made objects down to even less than one meter in diameter that appear at different times. Over the years I have collected a number of examples of images of my own coverage of fleeting aerospace events that effectively show what you are missing if you are not a satellite watching enthusiast. As a complement to optical and visual tracking, I use conventional and low light level video techniques, as well as still cameras as necessary. The observation of artificial earth satellites can prove to be meaningful, educational, enriching and rewarding not only to adults but also to children. Up until the mid 1990’s, the number of satellite trackers had been limited to a small cadre of really serious observers or analysts. 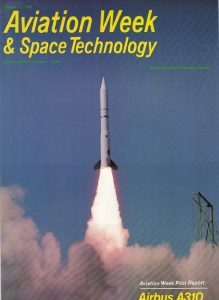 The advent of freeware and Internet sites such as that developed by the Belgian Working Group Satellites has focused information on techniques of observation and provided instructional aids and sources of data on orbital elements. More importantly, a remarkable user friendly web site called Heavens-Above (see link below) developed by Chris Peat has enabled the avocation of satellite watching to become available to Internet users around the world. I would like to acknowledge the excellent software (QUICKSAT and HIFLY), developed by Mike McCants of Austin, Texas that has enabled most of the observations I have been able to make over the last 30 years. Appreciation is expressed to Ed Cannon and Jeff Hunt who made valuable suggestions regarding the format of this web site. I would like to apologize for not having configured the photos as thumbnails. In some parts of the site, I reference 5-digit numbers to identify the specific satellite. This is the catalog number from the USSTRATCOM catalog.